You can try out these Asian recipes to have some different for your next meal. Lunar New Year has come and gone, and we are now in the Year of the Pig. Whether or not you rang in the New Year by eating thick-cut pork chops doused in soy sauce, honey, and garlic, you can try out these Asian recipes to have some different for your next meal. If you’re looking to eat more vegetables every time you sit at the table this year, then a veggie stir fry is an easy and delicious way to do it. 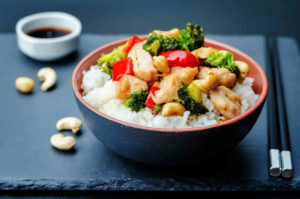 It’s garnished with tofu and covered in a yummy sesame ginger sauce that helps you overcome any texture or flavor profile objections you may have with the tofu component. Since this may not sound as filling as a stir fry with meat in it, you can also consider a chicken variant. Try mixing in teriyaki chicken that’s also been marinated in ginger sauce. In the mood for something more Thai-inspired? This is an appetizer that shows a clear overlap between Thai and Chinese cuisine. Toss noodles together with peanuts, cucumbers, and carrots, and you have a light but flavorful way to kick off your next banquet. If you’ve ever had matcha tea or green tea ice cream, then you know how delightfully energizing it can be. So if you’re wondering how green tea can be mixed into pancake batter, it’s green tea powder you’ll be after for this recipe. Try something radically different for a weekend breakfast, or play around with your regularly-scheduled meals and have breakfast for dinner one night. You might not have had gochujang before, but you have had sriracha sauce, and they’re quite similar. For those who are unfamiliar with it, gochujang is a spicy Korean chili paste that has spread out from its homeland and has gained popularity all over Asia. Let’s say you want to cut down on carbs and fats, but you can’t refuse the taste of hot wings. That’s where the gochujang comes in, although, for an added twist, you can make these “wings” with cauliflower instead of chicken or pork. Instead of a flour-based wrap, why not try lettuce? Whether you want to fill it with chicken, duck, pork, tofu, or veggies, these wraps are super refreshing and low-carb, perfect for helping you live up to your new year’s resolutions, whether you made them last month or this week! You can’t forget about the dumplings. Choose from Chinese soup dumplings, Japanese gyoza, or Korean mandu – all of them are tasty enough to make you want to eat four hundred all by yourself! This entry was posted on Friday, February 8th, 2019 at 2:27 pm . You can follow any responses to this entry through the RSS 2.0 feed. Both comments and pings are currently closed.